Theory of Change– Our theory of change links our beliefs, vision and mission to graduate every student college-prepared and career-ready. We are creating the conditions for success within every classroom, program, and school. Then, every student in our schools will graduate college-prepared and career-ready. Fostering highly engaged and life-long learners. Transform teaching and learning so that all youth graduate college-prepared and career-ready. Ensure there are effective employees at every level of the organization focused on improving student outcomes. Provide a portfolio of high-quality schools for all youth, families and communities. Ensure a safe, caring, and nurturing environment for all youth. Operate an effective, efficient, and transparent organization in order to assure the public trust. Transition to the Common Core State Standards in English Language Arts (ELA) and Mathematics so that content, teaching and learning is focused around concepts and skills to help students develop a deeper understanding and apply their knowledge. Ensure that all students graduate with nine college credits and the option to enroll directly into a college/university and be prepared for a career by implementing our College and Career Readiness Through Equal Opportunity initiative. Continue our focus and refinement of our Educator Growth and Development system to achieve our goal that every student will be taught by an effective teacher, every day, in a school led by an effective school leader, surrounded and supported by an effective team. Implement a Digital Conversion strategy to ensure students have equity and access to a personal computing device and high-quality digital resources and educational content anytime/anywhere. 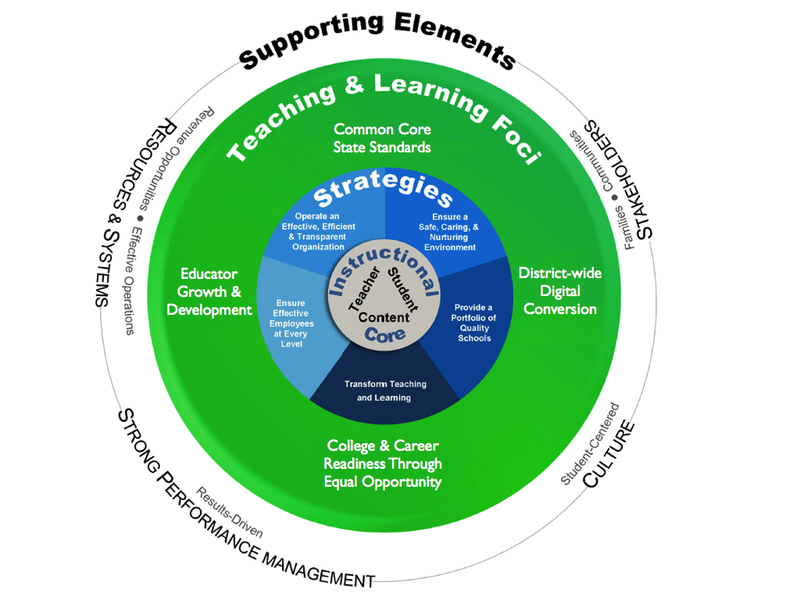 Supporting Elements– We serve all students and their families with a commitment to success. Our Supporting Elements hold the promise that every employee will work in the best interest of students. Stakeholders – Ensure that we are engaging our parents and communities to support students. Culture – Ensure that everything we do is focused on the success of our students. Strong Performance Management – Ensure that we constantly review data, with a focus on performance over conformance, to deliver the promise of all youth achieving. Resources & Systems – Ensure that we will run an efficient organization at every level.